Cliftonville travel to Shamrock Park on Tuesday knowing a first win over Portadown this season would effectively seal the Irish Premiership title. The Belfast club, aiming to retain the championship for the first time, have been beaten by the Ports twice in this campaign and the other game ended 3-3. With just two games left, Cliftonville are three points ahead of Linfield with a goal difference advantage of 12. Linfield, hoping the leaders slip up, are at home to Glentoran. Cliftonville boss Tommy Breslin said he expected another tough confrontation with Ronnie McFall's Portadown who are battling to secure third place and a spot in the Europa League. "Nobody knows better than us what Portadown are capable of and, with European football still in their sights, they are every bit as hungry for the points as we are," said the Solitude supremo. "After that, we go to Crusaders and, like all derby games, that will be a big test too but, first and foremost, we are preparing for the Ports and there is no talk of anything outside of that. "We are in a good position but we will not get carried away because football has a habit of kicking you where it hurts when you least expect it." Tuesday's match against Glentoran will be Linfield's last match in front of the old south stand at Windsor Park. The Belfast ground, which hosts Northern Ireland's home games, is to be redeveloped with the building of two new stands. It is also David Jeffrey's last home game as manager of the Blues as he is leaving the job at the end of the season. He had hoped to guide Linfield to the league title for a 10th time but last weekend's draw against Portadown was a huge setback. 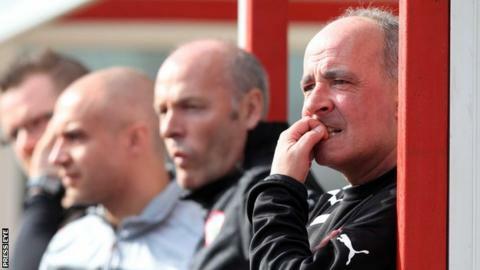 "We are looking for Cliftonville to be beaten twice and they have not been beaten for a long time," conceded Jeffrey. "But they have tough away matches against Portadown and Crusaders who are both going to third place. "But we have to do the business ourselves against Glentoran and then Crusaders on Saturday."